Every once in a while, something totally unplanned takes over your sewing time, right? In my current case, a new pattern and some just-released fabric caught my eye and just had to be partnered up. Enter the Wake Up Call block by Amy/Badskirt and Katarina Roccella's Imprint. I 'met' them around the same time, halted progress on all my other projects and set to work. I kept things small - 4 - 11" blocks, no sashing or border necessary. I played with layout and then settled in to quilt. I auditioned several of the Imprint prints for the binding, and though I finally settled on the gold "Morse Dot Sun," I didn't have quite enough, so over on the right side I filled in with "Crossthread Sheen". It's not real obvious in photos, but I'm glad it is in person. And I failed to get a shot of it, but the backing is Katarina's Floret Stains Tealberry. You know I had to keep it all in the family! I named this one "Snooze Alarm" as a nod to the block's name. Boy was I sad when it was finished. It's just so dang refreshing to drop everything and make something on impulse. And I find a small project like this a kick-start for the other projects that were interrupted. So now it's back to that 'to do' list! This is GORGEOUS. I love Imprint and need to get my hands on some. Plus, your photography is stunning! I love that first picture! What a beautiful quilt! 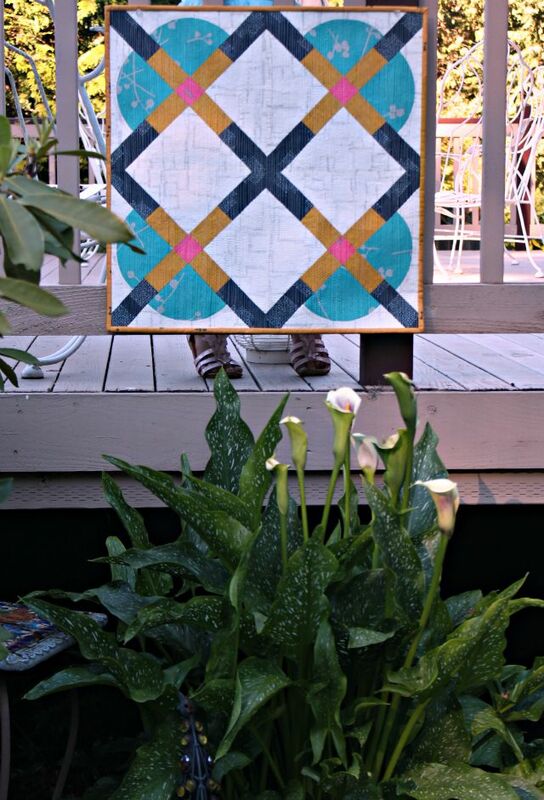 The designs, colors, quilting...you nailed it! It looks gorgeous peeking through those flowers! This is beautiful! I definitely have those days when an unplanned project jump in between things I m working on. That is why I have so many unfinished projects. Good for you for going through and finishing it. pretty amazing! and I love it in the garden. Beautiful! What an amazing design; it's absolutely right for these fabrics. I love the colours you chose. Reminds me of Carla's quilt today as well! I'll have to try mustard and navy myself sometime. This is so beautiful! And your 'staging' in the garden is just perfect. Great colors! 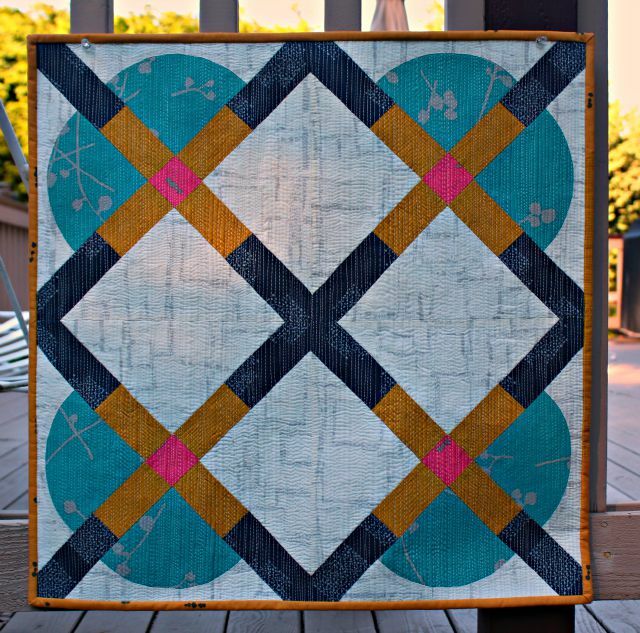 Such a stunning quilt and your matchstick quilting is just perfect! All that matchstick quilting would drive me to drink! 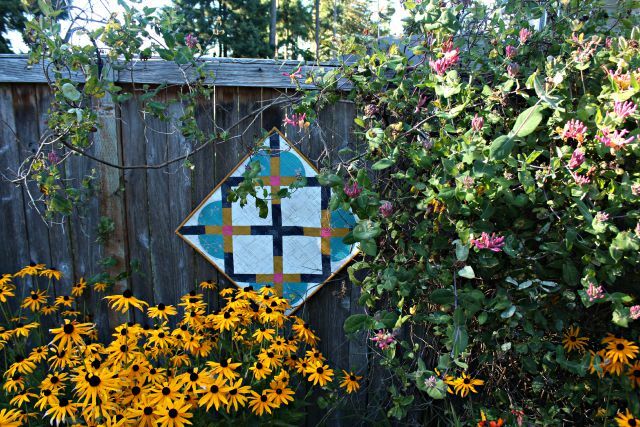 Great quilt and fabulous photos! So fun! I try hard not to get distracted by all the new ideas and pretties but sometimes you just have to! 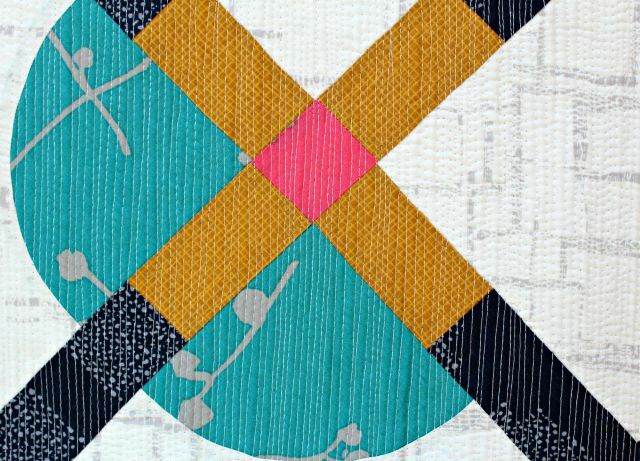 This is a great project, the colors so interesting and I always love matchstick quilting. I know that I am very late, but I wanted to stop and say that I think you knocked it out of the part with this one. 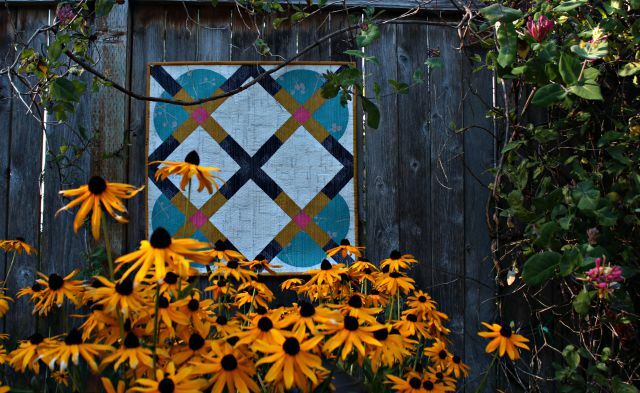 Amy's pattern is excellent and your colour and fabric choices and quilting are excellent. Debbie, I am so awed by your creativity.